December 10, 2011 by Venky. It was drizzling when I woke up and was doubting if people would turn up for the planned ride. But Baba Velo(aka Raj/RNair) who is town for TFN, was willing to ride so, I didn’t want to miss being there. I reached the Siva’s road start and met Shankar and Akshay there while Raj and Mark just arrived. Vijay Cp who was planning a Nandi ride also started around the same time. The road was wet but there was no drizzle at all. We started at a sedate pace before the guys warmed up and began to rip it. 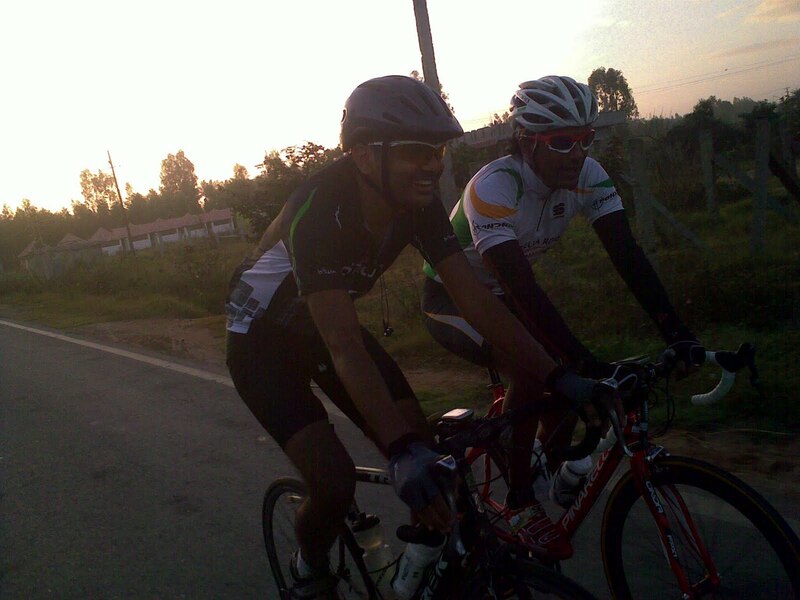 Birthday boy Shankar riding alongside Rajesh this morning just past Budigere where we were slowing down for Akshay and VijayCp to join. I was behind Mark and was trying to hang on. 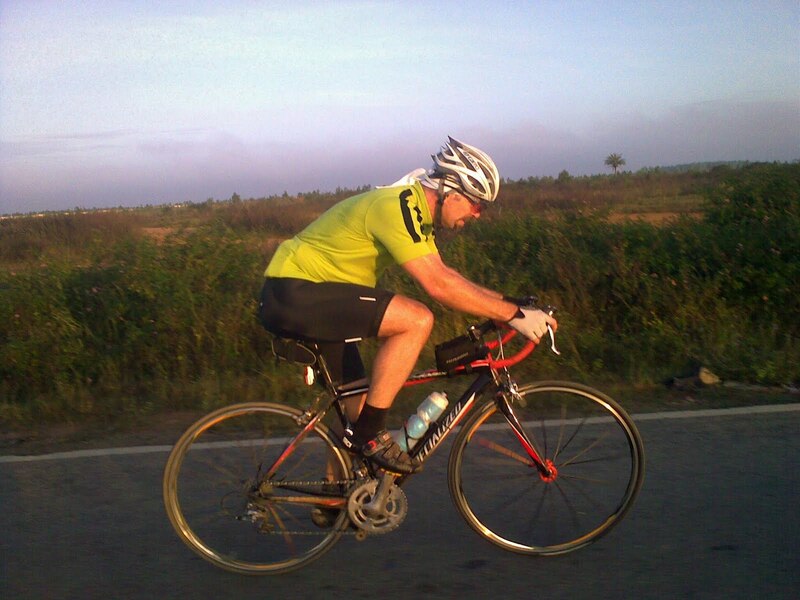 Even before we got to Budigere, I lost his wheel and my heart rate was shooting up like crazy trying to bridge the gap. It was clear that I’m in for a bit of a sufferfest today and also understood that I will probably not see them again if I lost their wheels. I managed to bridge the gap just as we approached Budigere and by that time Akshay and Vijay were no where to be seen. Raj observed that they fell back and told us to slow down for them. They joined us a couple of km after Budigere but unfortunately fell back immediately on the first incline and never caught up again. I just hung in there behind the guys. Mark on his Specialized Roubaix.. Great riding with him for the first time.. He is here for TFN. We reached the Nandi turn-off and stopped for a brief moment to decide whether to turn back there or ahead. Since we had more time, Raj suggested to get to end of the Nandi road before turning back. 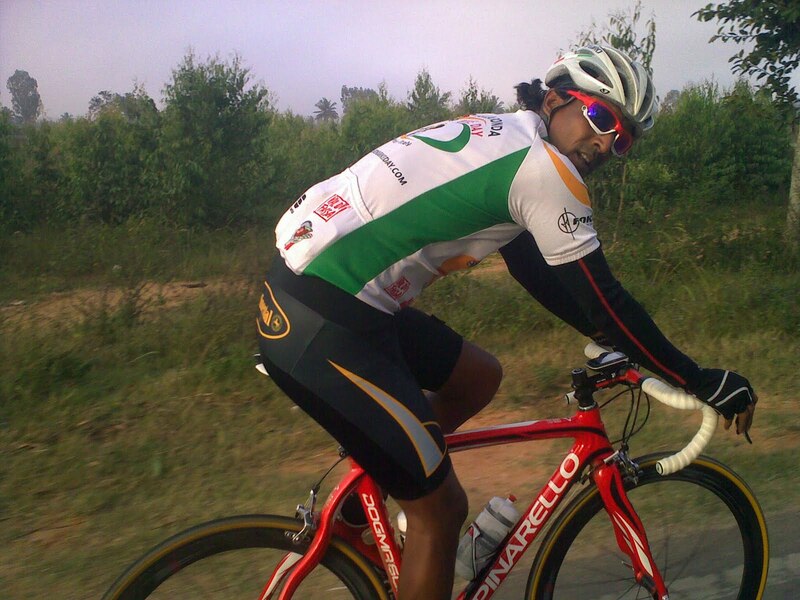 Abhilesh who was on his way to Nandi rode with us for that stretch before we turned back. The actual fun began on the way back. Nandi in the foreground.. We went till the last turn towards Nandi and turned back..
Raj, Shankar and Mark were taking turns in dishing out some pain and I was just trying not to lose their wheels. As we got onto Siva’s road I was seeing crazy speeds and it became difficult to hang on. I quickly got dropped and was struggling to keep them in sight. Raj saw that and slowed down the train a bit for me to board on. 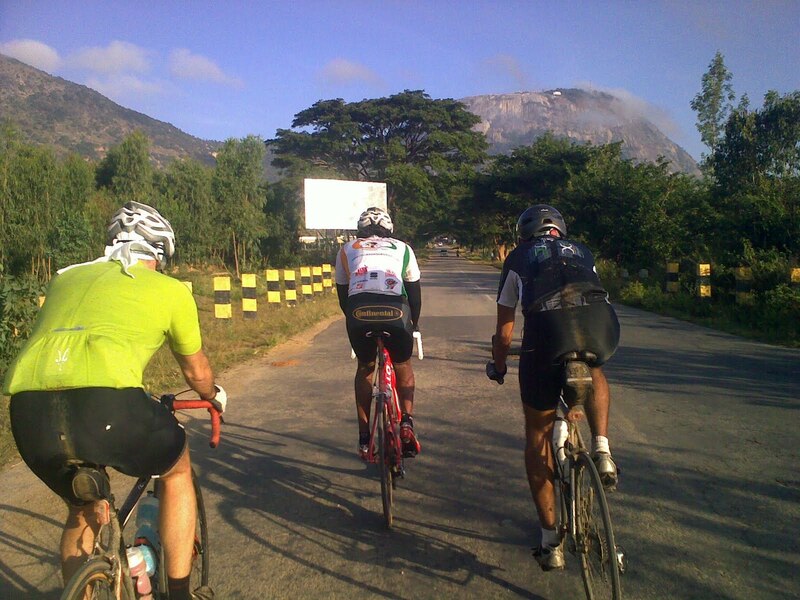 Just as I got on, on the incline Mark got dropped and Raj slowed down again until he joined us. Just as we were reaching the last incline before Budigere, Raj took off and three of us got promptly left behind. I was really thankful that he took off like that at that point of time because, it was getting really hard to hang on. 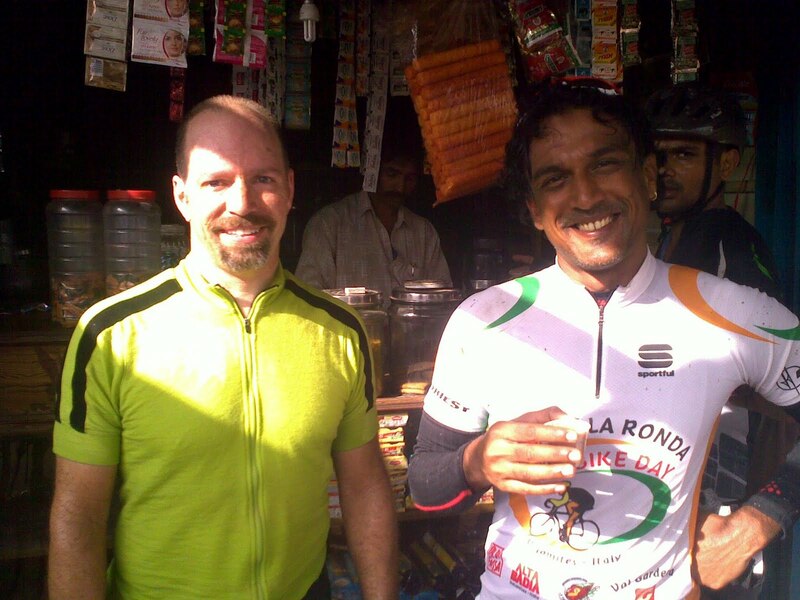 The last 12km or so, the three of us rode at a more sedate pace and reached the end where Raj was finishing his first chai. Mark and Raj with Shankar behind them at the end of our ride today..
After saying goodbye to Raj and Mark, Shankar and I rode back home. It was a crawl of sorts with traffic on the way back to my home. All in all an amazing ride. 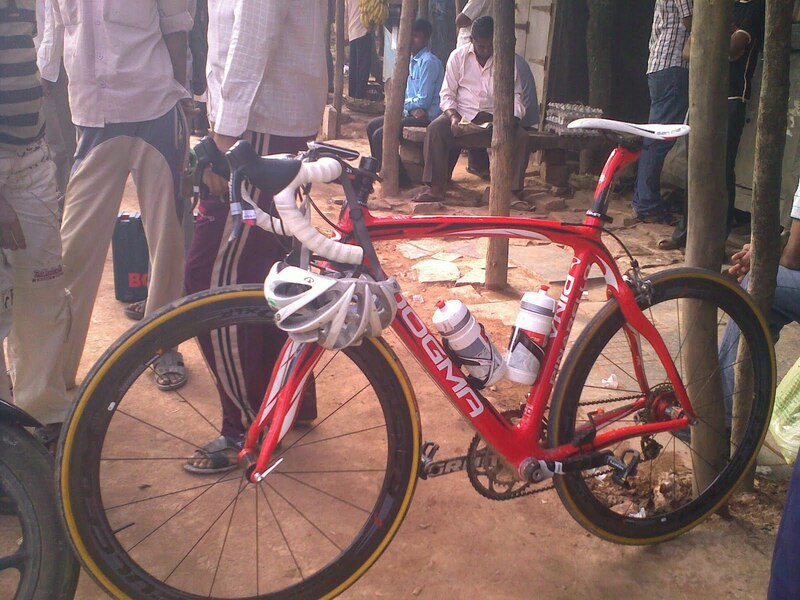 It was a pleasure riding behind the Dogma. What a beautiful bike! Amazing looker! Thanks a ton for the ride, guys! Happy birthday, Shankar!